Before deploying a new fiber cabling infrastructure, or reusing the installed infrastructure, it’s essential to understand the link budget of the selected speed and transceivers in the new architecture, as well as the desired number of connections in each link. In new fiber infrastructure deployment, more stringent link budget specifications will require higher-quality passive optical components with reduced channel insertion loss in the link. Typically, the low-loss connector not only allows more connections, but also supports longer links with solid performance. In a series of blogs, we have discussed these checkpoints. This blog covers the final checkpoint (No. 4): validating the optical link budget based on link distances and number of connection points. The current available ultra-low-loss adaptor is 0.2 dB for MPO-8/12 and 0.35 dB for MPO-24 per connection. These improvements have been achieved by a combination of new material and polishing methods. First, compared to legacy fiber, OM4 and OM5 fiber are made with tighter glass geometry specifications to provide better core-to-core alignment for minimal connection and splice loss; using fiber with higher effective bandwidth will also help address the ISI penalty, providing more link margin and reliability. Second, quality low-loss fiber trunk cable and jumper with finely polished connectors are also key elements to achieving minimal insertion loss and reflectance. Below, we compare the Ethernet link between legacy OM3 cabling and new OM4/OM5 cabling. With improved bandwidth, reduced fiber cable loss and connection loss, OM4/OM5 not only supports longer reach, but also supports more connection points. Ethernet link comparison between legacy OM3 and new OM4/OM5 cabling. Click to enlarge image. For example, a legacy OM3 system with ~0.5 dB per connection loss can only support a three-point connection with a maximum reach of 100 m for a 40GBASE-SR4 transceiver, or a three-point connection with a maximum reach of 70 m for a 100GBASE-SR4 transceiver. In comparison, a good OM4 duplex-pair or MPO-12 connector with <0.2 dB per connection loss will allow a five-point connection of 150 m reach for 40GBASE-SR4, or up to an eight-point connection of 100 m reach for a 100GBASE-SR4 transceiver with sufficient link margin. Due to singlemode fiber (SMF) core geometry and alignment challenge, it is difficult to attain the same level of performance as a multimode fiber (MMF) connector. The current ultra-low-loss single pair (i.e. LC-duplex) and arrayed connector (MPO-8/MPO-12) have an insertion loss of 0.35 dB and 0.5 dB per connection. The OS2 SMF attenuation specification has been ratified from 0.5 dB/km to 0.4 dB/km, allowing additional link budget margin to the connections. 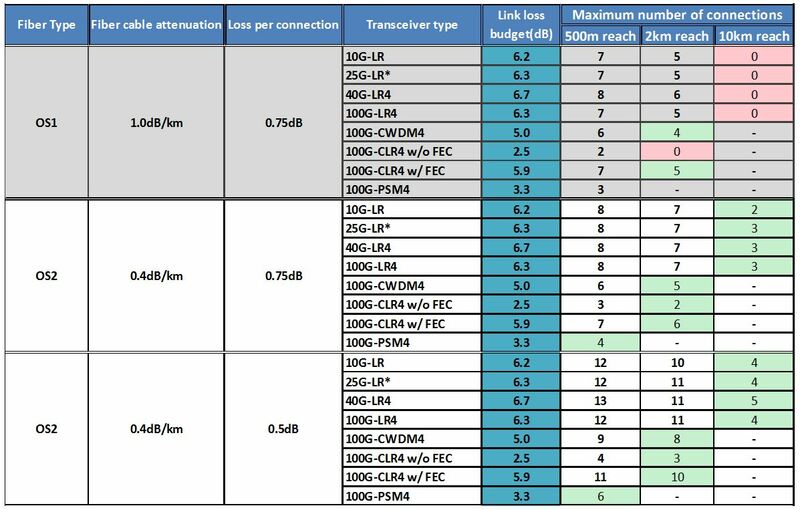 Below, we compare Ethernet link performance between legacy OS1 cabling systems and new OS2 cabling systems with 0.75 dB and 0.5 dB per connection loss. Ethernet link comparison between OS1 and OS2 cable with 0.75 dB and 0.5 dB per connection loss. Click to enlarge image. OS1 is a legacy cable with 1.0 dB/km loss; this specification cannot meet the 10 km reach target. As for the 500 m and 2 km applications, the maximum number of connections is also very limited due to lossy cable and connectors. In comparison, with 0.75 dB per connection loss, OS2 cable can support all required applications, while the maximum allowed number of connections might fall short for long-reach or no-FEC applications. When insertion loss is reduced to 0.5 dB per connection, it will support higher numbers of connections and allow more flexible data center architecture. This is particularly true for 500 m and 2 km data center applications where cost and volume are both very important for cloud service providers. The cloud is a game changer, and has already driven tremendous disruptive innovation in high-speed data transmission technologies. 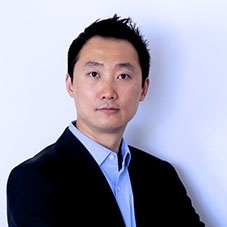 Today, cloud data centers are growing to hyperscale size, and will need longer reach and higher speed to support rapidly growing intra-DC and inter-DC data traffic. Singlemode fiber solutions are suitable for very large data centers; multimode fiber solutions are often the best, most cost-effective solution for small to medium-sized data centers. Today, with new technology and products, it’s beneficial to plan in advance. No matter which path you take, low-loss, high-bandwidth fiber cable with low-loss fiber connectors will always provide solid link performance and achieve the desired link distance, along with the number of connections you need. Later on this year, we’ll feature a series of blogs that focuses on specifics regarding link specifications for MMF and SMF in new data center environments, as well as specifications for optical fiber connectors. Don’t miss it – subscribe to our blog now! Belden has been developing optical fiber components for more than 40 years. Our fiber connectivity systems are the culmination of years of experience and expertise in a variety of applications, including data centers, premise and campus network backbone infrastructures, as well as fiber-to-the-desk (FTTD) applications and horizontal and centralized cabling systems. Our motto: Create fiber products that are faster to use, easier to use and better to use. Belden’s fiber cable and connectivity solutions for data centers reduce complexity, increase flexibility and streamline installation. We can help you with each fiber infrastructure deployment checkpoint, whether you’re installing a new system or reusing installed infrastructure. The end result is a data center solution that provides the speed and longevity you need while matching timeline and budget requirements.